Harold Pinter’s play put him on the map of Theatre greats. Before “The Caretaker” came along there was his “Birthday Party” that did not hold up as well. The Caretaker revolves around a disgusting, smelly man, who is basically a bum that is always looking for new ways to exist. A man with mental problems meets a drifter on the street (Jonathan). The mentally damaged occupant allows Davis (The Drifter) to stay at his trashed up tenement room. that is cluttered with junk everywhere. But to the Drifter, it is a treasure trove. Aston begins to get fed up with the smelly tramp, and asks him to leave. They argue over an open Window. Davis wants it closed – and Aston wants it open. Also, he tells Davis that he wants him to leave, because he smells. Jonathan Pryce as The Caretaker is absolutely marvelous. It seems so real. Heck it reminds me of all “The Caretakers” that come into my favorite Starbucks. One daily occupier even looks the same as the “Caretaker” on the Curran stage. You know what – the acting in this show is so strong, that I can actually smell the old man’s body odor. As you know — Pinter’s sparing dialogue is extraordinary – and it takes really great actors to pull it off. There is a strange fascination about the entire story. There are glimpses of compassion, modesty (while the tramp undresses for bed). The modesty becomes him. There are the frightening moments, when the scary and menacing Mick appears at the dreary flat. He pretends to be helpful and friendly, but don’t kid yourself – he is devious and dangerous. Then again Mick does seem to care for his brain damaged brother. The Caretaker ends in a mystery. He’s creepy, yet engaging. One minute you hate him, and the next moment – you are busy trying to figure out who is out maneuvering whom. 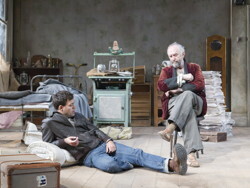 The Caretaker is a psychodrama, farce and above all – “A Masterpiece!” It’s a riveting journal that will remain with you. And here’s the best part of the Evening – There is an intermission. THE DREAM CAST: Jonathan Pryce is “Sensational.” – Alan Cox – “Exhilarating Performance!” – Strike up the Band, cause the devious troublemaker, Mick (Alex Hassell) is “Totally mesmerizing!” The Director, Christopher Morahan, is a Genius. This is no ordinary play. The performances are extraordinary! It’s rare to find actors so comfortable on stage as Brian Miskell (Evan), Peter O’Connor* (Jasper) and Haynes Thigpen* (KJ). Jasper and KJ–kinda take us back to the heyday of Haight Street in the 70’s. There’s the Guitar – the drinking, and some kind of stuff called ‘sroomtea, that KJ drinks. The beverage sort of looks like tea – but he adds other things to it as he relaxes on the backyard of a little café. As the two older guys are told by the management, that they can’t sit in the backyard. Evan (Brian Miskell) who is seventeen, at first doesn’t know how to deal with them. On one hand he is fascinated in this new world, and on the other hand – he wants to keep his job. KJ and Jasper spend all their time leaning against the trash bins. The charming, wide-eyed Evan doesn’t know what to think about them, as Jasper reads his novel to TJ. “Hey man” – he says to Jasper. “You’re play is turning me on.” Talk in “Aliens” is very sparse. There are lots of long pregnant silences. When they do talk its in very short sentences like: “Why do people Practice lighting fireworks?” Annie Baker’s play sure knows how to make us feel emotionally close to the on-stage stoners. Baker has managed to capture a “tightly constructed terrific play.” It’s highly polished entertainment. This is the kind of the play that seems very real. Those people on the stage are more real than I could have imagined. The silent moments may seem strange – but the ‘moments’ are still telling us something. Like me, you will read between the lines. Believe me – this is one terrific stage play. And hey, here’s the best news – “There is an intermission. That alone will make the night special for you. HERE COME THE DESIGNERS: Bill English has again turned a small stage into a miracle. Michael Palumbo’s Lighting is just perfect. The Sound effects by Brendan Aanes is perfect. Christine Crooks Costumes are right-on. Fabulous direction is by Lila Neugebauer.